Home Personal Finance Is It Okay to Buy a Refurbished Product? Is It Okay to Buy a Refurbished Product? Most refurbished items are electronics. We’ll stick to that category for the sake of this post. If you’re concerned about buying refurbished, electronics are probably your concern. So many parts to break. 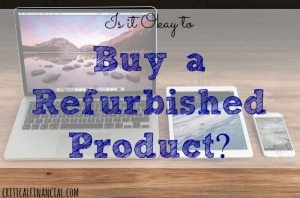 So is it okay to buy a refurbished product? When I say ‘okay’ I mean, is saving the money worth buying a possibly inferior product? We’ll soon find out. Exactly what is a refurbished item? ‘Refurbished’ is a catch-all term. It can mean a lot of things. It may have been damaged during the first time it was shipped. Or maybe it got dinged on the assembly line. Someone will need to buy those giant TVs surrounding the perimeter of Best Buy. Or maybe the item was used to showcase this model at a trade show or the like. Sometimes it’s as simple as the first buyer deciding to return the item. Many companies such as Amazon and Kohl’s offer long return policies. This means a lot of their merchandise comes back and gets resold. Maybe quality control was a little sloppy on Friday afternoon. Maybe someone forgot to solder the right battery pack into the iPad. Who knows. But sometimes refurbished just means the product had a slight problem which has now been resolved. How much are refurbished items discounted? Refurbished items usually go for a 15 to 30 percent discount. What is their failure rate compared with new products? That’s a difficult question to answer. It’s basically impossible to answer. So in order to decrease your chances of buyers remorse, get a refurbished product with a warranty. Or, make sure the item is ‘factory certified’. Or at least make sure the item will be able to be returned within a reasonable time frame if necessary. One cool thing worth noting about refurbished products is their resale price. Let’s say you buy a new laptop each year. Instead of buying a MacBook Pro for $1,499, you can score a refurbished one just a hair over $1,000. Then, when you go to resell, it’ll probably still be worth $1,000 in a year. See, the second buyer compares your asking price with the retail price. Buying refurbished can get you a free laptop each year. How about that! I enjoy buying refurbished items. The only thing I don’t like is how they tend to slap a giant ‘refurbished’ sticker on the item that’s hard to remove. Even though it’s foolish to think, it’s kind of embarrassing. I don’t know, maybe it’s just me. 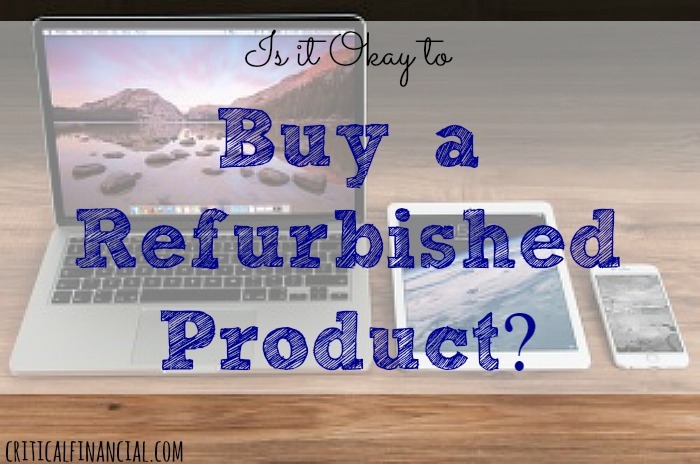 But overall, is it okay to buy a refurbished product? Yes. Just avoid buying one ‘as is’. Buy one that has the support of the manufacturer or at least the retailer you bought it from.